Series consists of pamphlets, 8 Student Assessment folders that includes materials on Exercise Muskrat Scramble, Tank and Infantry Operations, Officer Classification Training 1972, Repair Schedule and Times for Rifle 1986, and Heating and Ventilating Products. 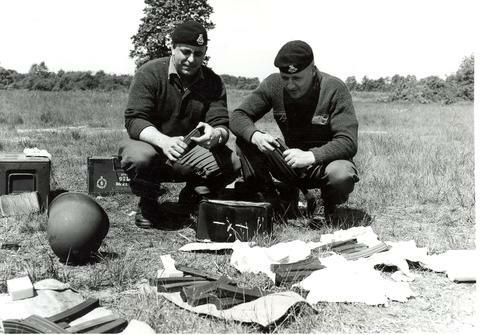 Signal Training includes textual records regarding COTC Royal Canadian Army Service Corps Training Phase I May to August 1956 and Phase II May to August 1957 plus handouts for May to August 1957. A Folder of records of RCASC Precis 1952-1957, a Folder that includes materials of Light Armoured Troop Drills .A 10 page binder that includes 1985 Camp Maps, Command Structures, Operation Orders, and Training Diagrams. A Binder that has materials regarding Fundamentals of AFV Gunnery (cougar) 1989. photographs, Instructions and Drills and Cavalry Tactical Formation.